International heartthrob artist Chris Cayzer returns in the country to share his music with his fellow Filipino. And one of his gigs was the very successful "Soul Nite" happened in the APEX Lounge of Seventh High in Bonifacio Global City (BGC), Taguig. During the event, Chris performed three sets of music with his fellow band mates. And one of his band mates was Ali Alejandro, the son of the OPM icon Hadji Alendro and the brother of Rachel Alendro. Chris performed rock, acoustic, and RnB music. He even shared his own rendition of the hit songs like "Glad You Came" and Rihanna's "Diamond in the Sky." He even serenaded his guests with classic love songs with a modern rock touch! Present during the "Soul Nite" were the Bloggers of the Popular websites like "The Web Magazine," "Lakwatsera Mom," "Orange Magazine," "Ely's Planet," "TV Series Craze," "Bits of Rocks," and yours truly, "The Lifestyle Portal." The Bloggers jammed with the heartthrob singer! Also present in the event was the "Pinoy Big Brother Teen Edition Season 1" ex-housemate Aldred Gatchalian. He jammed with Chris singing his version of "Wherever You Will Go." Chris became more popular after he joined the 2012 Australian X-Factor where he emerged as one of the Top 25 finalists. But prior to the said reality singing competition, Chris already appeared in the three giant networks namely ABS-CBN, GMA-7, and TV5. He was the mainstay in the musical variety shows like "ASAP," "SOP," and "P.O.5" He even starred in the movies like "Close To You" and "White House" and in the TV Series like "Bituing Walang Ningning," "All My Life," "Maynila," and "BFGF." 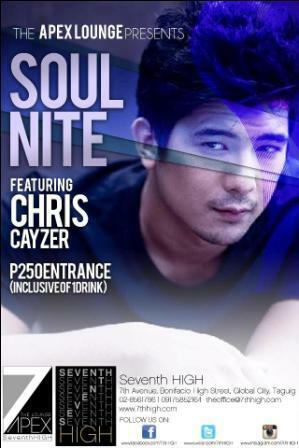 Chris has a regular gigs in the bars like Bagaberde 101 in Pasay City and in Seventh High in BGC The Fort Taguig.